Lately, I've been thinking about the importance of spending time with Jesus daily. Tour life does not always present opportunity for good, long 'quiet time'/'Jesus time'/'devotion time'/'personal bible study time'...or whatever you call it. Often we Ballet Magnificat dancers pull inconsistent, irregular hours and have to learn to be flexible. Our lifestyle forces us to get creative with how we get our daily dose of truth. Maybe you can relate? filling up one's soul with biblical truth on a daily basis is so important for every Christian believer to do, no matter what the lifestyle. Not only should we be in the Word because we are simply instructed to SEVERAL TIMES in the bible itself (Joshua 1:8, Romans 10:17, Timothy 3:16-17, Psalms 119; to name a few places in scripture), but also because it is like our instruction manual and guide for life. The Bible was written and provided for us by our maker, God, so we should live by it! Our Maker sure does know what He's talking about! John 6:35 Jesus said to them, "I am the bread of life; he who comes to Me will not hunger, and he who believes in Me will never thirst." Job 23:12 I have not departed from the commandment of his lips; I have treasured the words of his mouth more than my portion of food. 1 Peter 2:2 like newborn babies, long for the pure milk of the word, so that by it you may grow in respect to salvation. Psalm 34:10 The young lions suffer want and hunger; but those who seek the Lord lack no good thing. I believe the Lord chooses to compare the truth of his word to food because it is so relatable to us! You don't go one day without eating food for your physical nourishment, do you?! Then why would you ever stave yourself spiritually? I am reminded of a particular story of the Israelites in the Old Testament during the time of their wandering in the desert after having fled from Egypt. They had to rely on the Lord for all their needs while in the desert. Chapter 16 in the book of Exodus talks about how God provided food for them, nourishment from heaven referred to as manna. Exodus 16:14 Then the Lord said to Moses , “I will rain down bread from heaven for you . The people are to go out each day and gather enough for that day . In this way I will test them and see whether they will follow my instructions. In Exodus 16:19 the Israelites were commanded not to hide or horde the food from heaven, not to store it away for later or make it last more than one day. What I take this to mean is that we too should neither "horde" our spiritual food or expect ourselves to be able to run off of old manna for too long. Are you catching my drift? I believe we should be able to apply this passage about the physical nourishment God supplied the Israelites with and his instructions about it, with the spiritual nourishment He supplies us with. We must depend on God for our nourishing needs (for everything in life), and seek him for new 'manna' Daily! In order to build a deeper relationship with Jesus, our Savior, we need to meet with him in quietness each day. If supernatural nourishment is what you need spiritually, physically, and/or mentally, I advise you: Don't stand him up, no matter how busy you are! You won't regret it! I know it from experience! I know what it feels like to trade in time with the Lord for settling for the things of this world, left feeling spiritually dry as a desert, but I also have experienced what happens when you make seeking the Lord a priority in life. It amounts to peace, wholeness, transformation, and liberation. It really is a battle of faith and obedience. Making a habit of getting into God's word daily is a battle worth fighting for. Even being apart of an American Christian ballet company, reading my bible every day can be a challenge, a fight. There are times when 15-20 minutes is all I can spare in my day to spend time with the Lord. I used to condemn myself for "running out of time". In my mind, 15-20 minutes was not very long so out of discouragement, what I used to do was just throw in the towel and give up on having quiet time altogether. I lacked any faith to believe that God would meet with me in such a short amount of time, but in my perseverant pursuit to know Jesus better, I have learned a thing or two about the fight for making time with Jesus. One of the most important things I have learned and want to share with you here today is that God is entirely capable of speaking to me and blessing my soul in however much time I offer up to him, whether I have much time or little! It was wrong for me to put God in a box and think that he wouldn't/ couldn't speak to me in a short about of time. Since learning this lesson, I have come to experience how God can so powerfully blow me away with just one scripture, filling me with enough encouragement and faith to last me all day! It doesn't always have to be a whole chapter of reading, an hour long, or whatever other preconceived idea one might have. All that to say, I shouldn't consistently settle for giving God only 15-20 minutes of my day, but if the case is that that's all I have time for, I shouldn't waste time condemning myself about it but just give it to him. The truth is, spending time with God and reading His word needs to be a priority in our lives. Exodus 23:19 says "Bring the best of the firstfruits of your soil to the house of the Lord your God". Another important lesson I've learned recently is that much more is accomplished when I seek the Lord first, compared to what is accomplished in all my striving, and scrambling, and toiling, and doing, without seeking Him first. ↑ Convicting much? Sometimes I am also tempted to think my ritualistic commitment to read the Word of God every day may be legalistic, or maybe sometimes I am afraid of the appearance of it being legalistic. But the last thing I will share with you that I am learning about is that there is a difference between legalism and discipline. This realization came as a huge relief to me. I know I am in the clear because discipline is what I am after and discipline is a fruit of the spirit (Gal. 5:22). 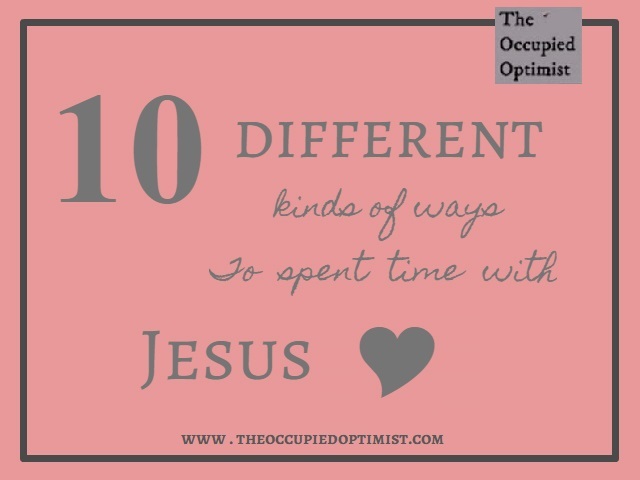 The following are 10 different ways I may choose to spend time with the Lord on any given day. Music. I usually like to have my quiet time in the mornings so often times I start my day with a worship song or two to help me wake up and get my heart focused. Choose one of these acronyms as a guideline if you'd like and get praying! If an eventful day is to be expected, I like to cover all my plans in prayer. Then after all that praying, know that it is also important to keep an open mind and follow up your praying with listening/ being sensitive to the voice of the Holy Spirit! Corporate and Global Prayers. After spending time praying for myself, I try to make a point of praying for the people around me, friends, family, community, the government, other countries etc. Praying for these things does not always come naturally. I have to ask the Lord to give me a heart for what/who He has a heart for. Journal. I enjoy writing out my feelings and thoughts about the day or previous days. Sometimes I write out my prayers. I write and listen. Stream of thought Journaling. Often times when I sit down for quiet time and I feel empty, uninspired, or unmotivated it helps to me to sit down with my journal and just write anything and everything that comes to mind until clarity, a word, a vision, or a prayer focus comes to mind. Bible reading plan. I usuallyBible reading plans out there such as going through it chronologically, reading two books at a time- one from the Old Testament and one from the new, or the Bible reading plan for reading the whole Bible in a year which is what I might decide to go with for this coming year. I suggest always beginning your Bible reading time with prayer, asking the Lord to bless your time of reading and speak to you through his Word what he wants to, and that you would not miss it. A Bible Study or Devotional. If I am going through a Bible study book with my church or maybe I am just going through a daily devotional book for myself, I usually carve out some time for doing those things! Supplemental reading. Occasionally I will be reading through some theological, or soul enriching material. Reading a chapter or so from those materials may take place during my quiet time but I am resolute that supplemental reading should never takeover or replace my 'quiet time' and Bible reading time in its entirety. Scripture Memorizing. I'll be honest, I am not good at memorizing Bible verses (or good at memorizing anything for that matter), but it can be done. All it takes is applying myself, and LOTS of repetition. The scriptures I choose to memorize are often times the faith building and encouraging ones which help me combat the lies I am confronted with each day by the world and the enemy. The ability to triumph over these lies in my mind at any given moment with biblical truth makes the practice of scripture memorization worth the effort. Scripture Meditating. Sometimes during my time of Bible reading, I come across a passage of scripture that I just get fixated on that makes it difficult for me to continue reading. It may be a passage I need to spend more time digging deeper into. Sometimes a biblical word study is in order. I can spend multiple quiet times researching the passage, marinading in the truth I glean. Taking time to fully understand what I am reading in the Bible is always worth it's while leaving me with a deeper knowledge and understanding of who God is and who doesn't want that? Check out my top 10 favorite online Christian resources for enhancing your quiet times. Those were just a few ideas of what I like to do during my quiet time. I hope they inspire and spur you on that you might offer to God the best of your first fruits. With a new year on the horizon let us all strive to seek the Lord in a greater way then we had this past year. Scripture says in Jeremiah 29:13 that when we seek the Lord with all our heart, we will find Him. How does your quiet time with Jesus look? Do you like to have your time of devotions in the morning or in the night, and why? Share your ideas and thoughts below! Thanks for reading! God Bless!